(Standing, l to r) Two Doors Away Café employees Jody Simonian, Phil Sitter, and Cathy Mall with customer Jeff Pichierri and Rachel and Chris Pond, café managers. (sitting, l to r) Jane Pond, owner, Northborough Police Chief William Lyver and Officer Joe Galvin. Photo/Melanie Petrucci. 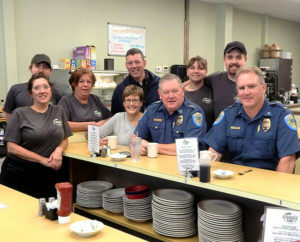 Northborough – Northborough Police Chief William Lyver and Officer Joe Galvin visited two local dining establishments Oct. 3 to mark the third Annual “Coffee with a Cop” event held in conjunction with National Community Policing Week. 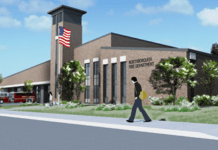 The “meet and greet” is an initiative to help residents meet their local law enforcement in a casual environment and discuss questions and issues they may have. Lyver and Galvin first met with residents at the Two Doors Away Café, 249 West Main St., before making their way to Chet’s Diner, 191 Main St.